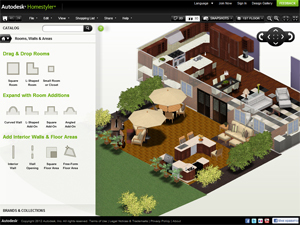 Autodesk Homestyler is a tool that enables you to quickly produce a 2D or 3D model for home design. It has a simple drag and drop interface that does not require consulting any tutorial. 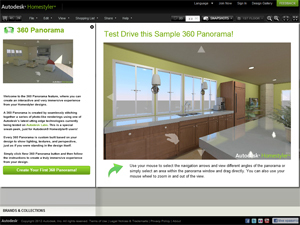 For furnishing homes, Autodesk Homestyler provides actual stuff from top manufacturers' brand catalogs, which means you can buy the exact products from the market. The 3D renderings give you a realistic sense of lighting, textures, surfaces and angles giving you an impression as if you’re standing right inside your project. You can share your design on the Homestyler gallery, through social media like Facebook or Twitter, embed it on your own webpage, and export it as a JPEG, DWG, or RVT file.